Pant problems are scary, but not with Nina Leonard's high-tech crepe skinny. 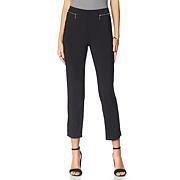 This pant serves to meet your seasonal style requirements all while giving you a flattering fit. Take it in nighttime and make it your daytime must-have too. I bought 2 of these when the price was much lower and am really glad I did. They are simply beautifully made pants. 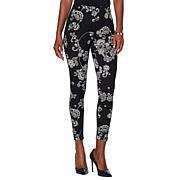 They are cut generously, I normally wear a size XL in HSN pants, and do in these as well. My hips are 44 " and my normal inseam 30", height 5'7". These are super comfortable and fit great. I love the waist being slightly higher and little ruffles are so cute, and yet NOT cutesy. 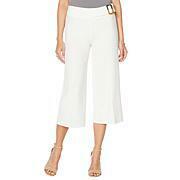 These are well worth the price, PLEASE bring them back with SPRING colors & pastels!! 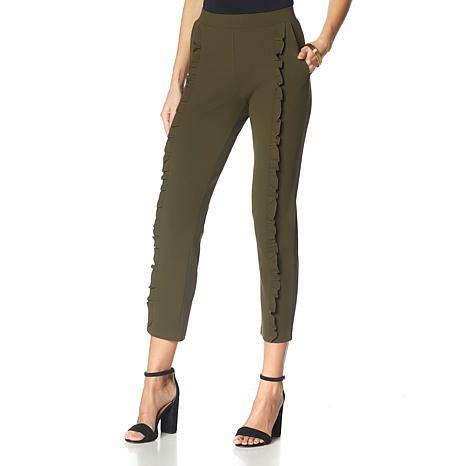 I purchased these pants in black and loved them so much I ordered them in olive too! The fabric is wonderful - no wrinkling and so comfortable. The ruffle down the front makes these so unique and flattering! I will wear these to work, but I packed them for a recent cruise and wore them with a dressy blouse and heels. I highly recommend these fabulous pants! I will definitely keep my eye on new offerings from Nina Leonard! These pants are fabulous. They are so cute. The material is great. The fit is perfect. I am petite and love the look. The ruffles make them look so different and elegant. I went back and ordered another pair. First time ever buying from this brand. Love these pants. They feel great. Just tried my new pants on and they fit perfect. I am a size large, the pockets lay flat and do not bulge. The fabric is a nice weight and look more expensive than the price you are paying. I bought these in black and the fit is spot on. I love the ruffle and the pockets. They were not as short on me as the models as I am on 5'3" but I like the ankle pant look. Very comfortable as well and looks great with the pleated back top that I bought as well.